‘Quick’ here means rice cooked in microwave. 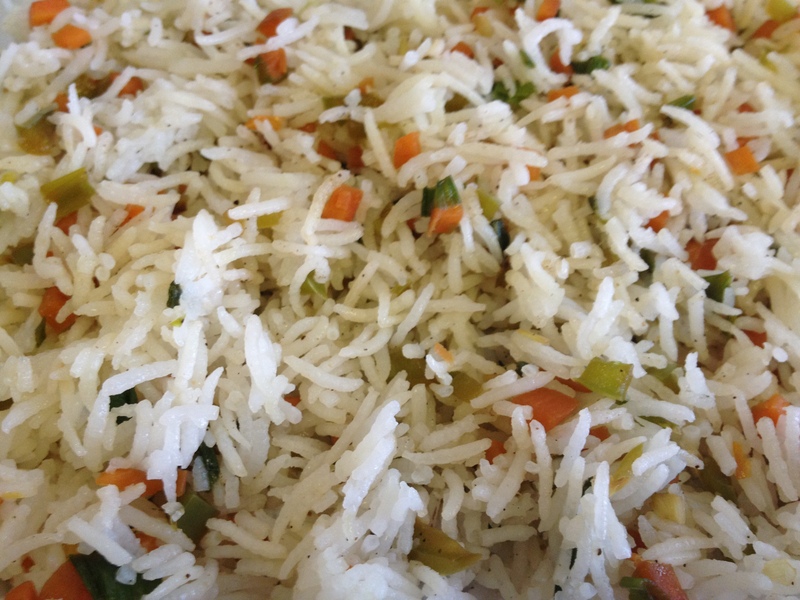 By the time rice is ready, the vegetables can be cut and sautéed. Just mix and serve. In a large deep bowl, add rice, celery, butter, chicken cube and water and microwave covered for 12 minutes. Take out and fluff with a fork. Discard celery sticks. Heat 1 tbsp oil in a wok or large nonstick pan .Add capsicum, stir for few minutes and add carrot and spring onion. Stir few minutes on high flame. Add rice, sprinkle soya sauce and pepper powder and mix well. Adjust salt if required. 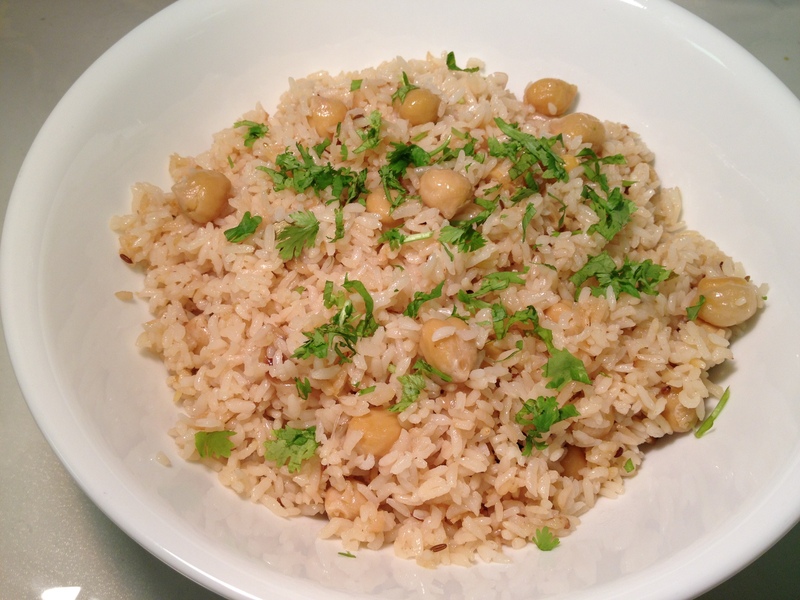 Easy chickpea rice if you have some cooked chickpeas in freezer. 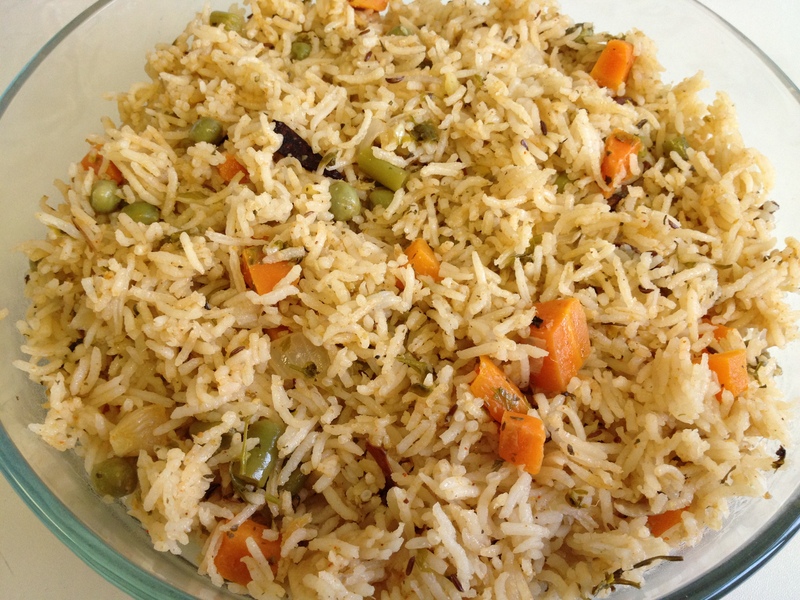 I used jeera rice for a change. Heat oil and add whole spices. When they splutter, add sliced onions and sprinkle some salt. This will brown the onions faster. When the onions turn brown (its important to brown the onions, otherwise rice will not get the brown colour), add water, chickpeas, rice and salt. Close tightly and keep on a low flame. Open the lid after 10 minutes and stir slowly. If there is any water left, close the lid for 2-5 more minutes or else take off from the flame. Garnish with coriander leaves. Serve with yoghurt raita and papad. You can use tinned chickpeas also. 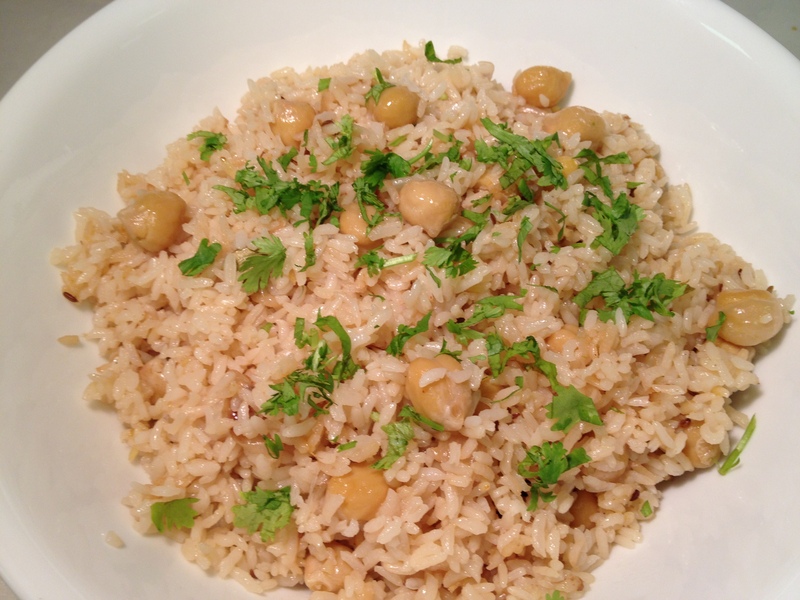 If using dried chickpeas, soak 1/2 cup in water overnight and pressure cook the next day for 2 whistles. 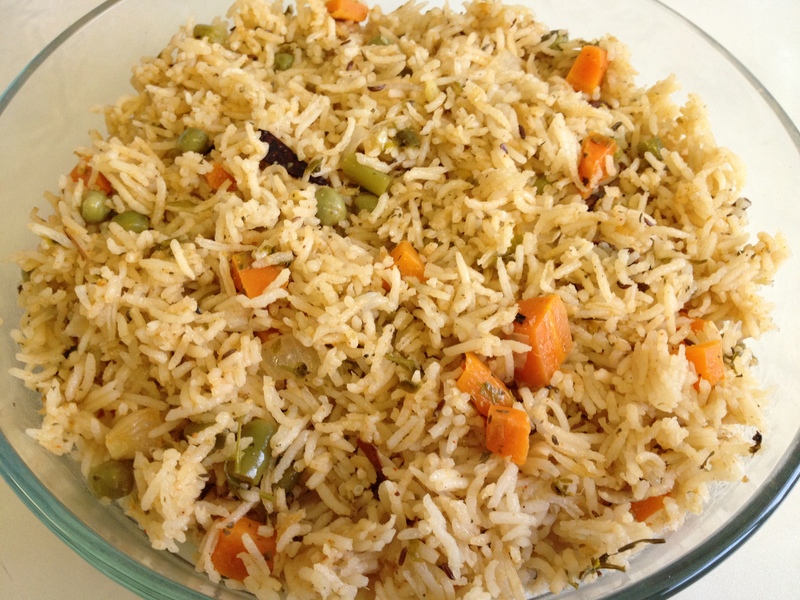 You can also fry the rice in onion before adding water, though not necessary. 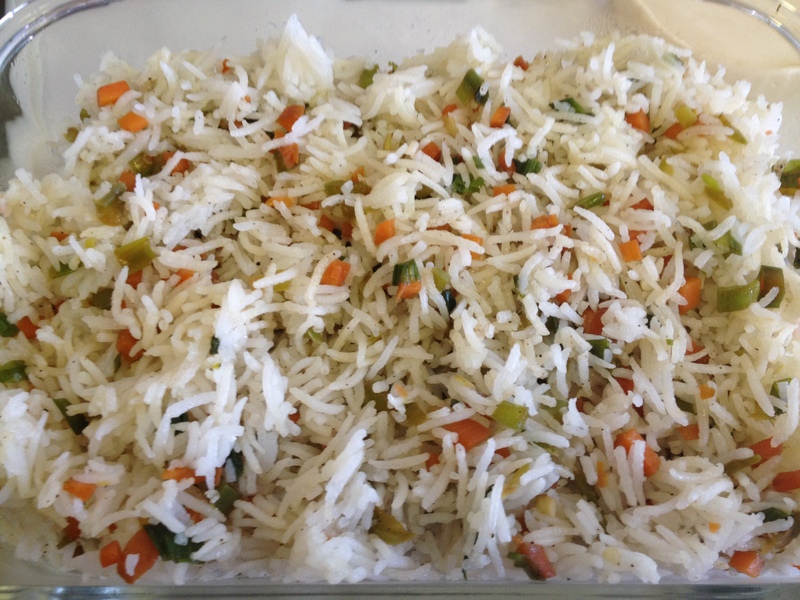 Don’t open the lid before 10 minutes and also don’t stir often as this will result in sticky rice.